They hold their signs proudly while their eyes scan the road. It’s not easy: being in the right place at the right time. All the while they wonder: Do I have their pace right in my head? Did I miss them? Kimberly Westrich was with her four-year-old son, Freddy. They had their first viewing spot at the Marine Corps Marathon staked out early enough to see the first wheelchair athletes come through. 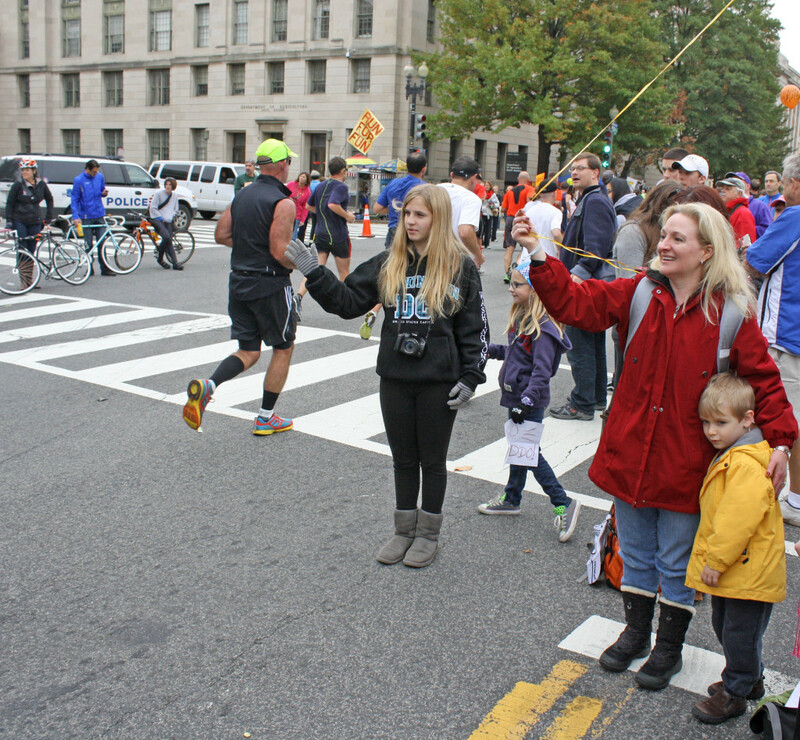 There they were around the 15.5-mile mark – at the bottom of 15th Street, near the Tidal Basin – supporting Dad (Rick Westrich, 43) during his first marathon. After a couple hours of waiting, it all happened so fast. He swung back, gave her a kiss. He stepped up off the road, bent down to Freddy and planted a whopper on his cheek. “I love you,” he said, as he ran off. Kimberly picked up her backpack, took Freddy’s hand, and the two of them started walking to the corner of 15th and Independence. Vanessa Chapman described her daughter, Erika Ross, as her advocate. Chapman has had multiple sclerosis for eight years. Since the diagnosis, she said, Ross has run or walked to support efforts to find a cure for the autoimmune disease whenever she can. 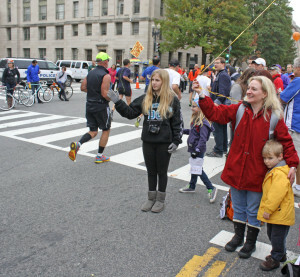 Ross ran the Marine Corps Marathon for Run MS. And Chapman, to be there with enough time to give Ross a hug before the race, left Baltimore by train at 6 a.m. After wishing her daughter luck, Chapman, who supports herself with a cane, waited for Ross in the family link up area at the Finish Festival in Rosslyn. While Chapman waited with a friend and her daughter Ashley, Ross’ friends, Emily Downing and C.J. Aldrich, made their way to a spot between miles 10 and 11 on Rock Creek and Potomac Parkway, close to Memorial Bridge. Ross and Downing have been co-workers for eight years. Aldrich, meantime, said he wanted to return the favor for all the support Ross gave him when he trained for and raced the Marine Corps Historic Half. 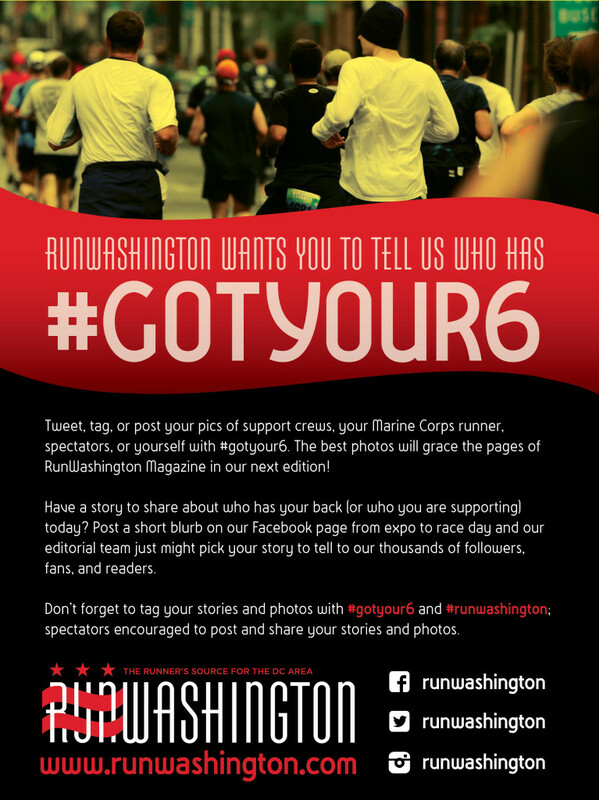 Downing lives in Silver Spring, and has supported Ross at all of her marathons. That includes two MCMs, but also the New York City Marathon. They also do an MS Walk event together every year in Ocean City, Md. Downing and Aldrich knew Ross’ goal time was 4:30. 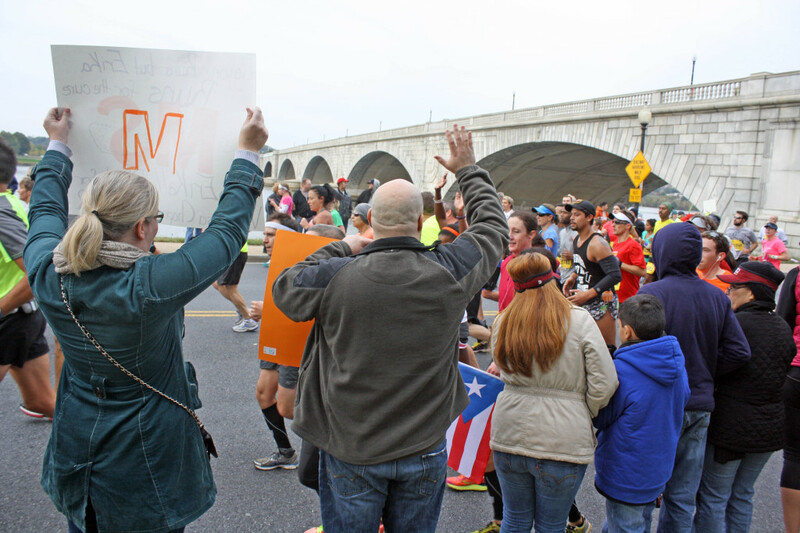 As a 4:15 pace group came through, they knew they had to start paying extra-close attention to the stream of runners heading south towards Hains Point. 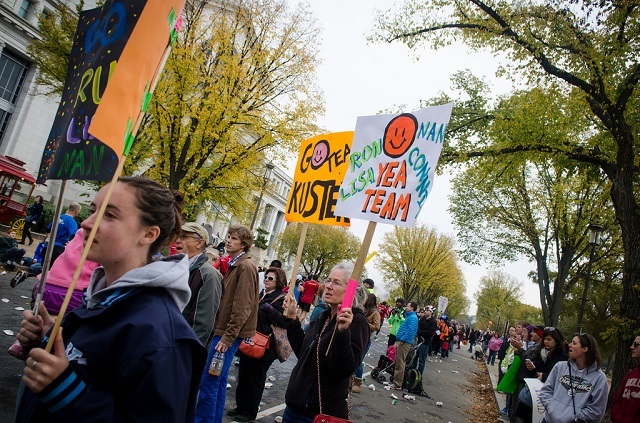 As Ross ran by with the 4:30 pace group, Downing and Aldrich shouted her name and held up their signs. Ross, full of pep, threw her hands up in the air as she passed, a sign she was having a great day. In the final miles, she surged ahead of the pace group to finish in 4:26. When she arrived at the link up area, Ross was all smiles. Chapman, too, showed no signs of fatigue. “I can’t tell you how proud of her I am,” Chapman said. Kimberly Westrich had a plan. Actually, she had a timeline: the way she hoped everything would go plotted out on a spreadsheet. Kimberly was supposed to get up at about 6:30. But she woke up at her home in Herndon two hours early, around the same time Rick woke up in his hotel near the starting line. Kimberly and Freddy hit the road at 7:30 a.m. and drove to the Vienna Metro station, where they took a train to the Smithsonian stop. They were easy to spot. Kimberly, following a tip, bought a balloon so Rick would have an easier time seeing them. The balloon – Freddy’s choice – was Simba from the “Lion King,” and it was attached to at least 10 feet of string. When Catherine’s brother, Tim Schombert, passed by, he stopped by the side of the road and admitted something that made everyone, including himself, laugh. After Rick passed, Kimberly and Freddy made another very short walk to the intersection of Independence and 14th, just past the 20-mile mark. Kimberly knew Rick was entering new territory. His longest training run was 18 miles. 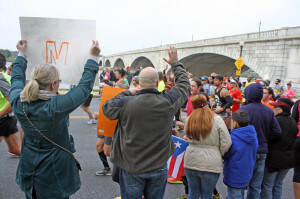 She found a spot in the long line of spectators stretching out towards the 14th Street Bridge. It was a frenzy: with the cheers, the upcoming water stop, the police trying to keep people out of the race course, and the drum group pounding out a relentless rhythm. Freddy showed no signs of fatigue. He was, however, getting a little antsy – more interested in picking up leaves, it seemed. Kimberly kept Freddy at her side and her eyes on the runners coming around the turn. This was the last chance to see Rick before they headed to Rosslyn. Simba swirled in the wind, floating up in the air above the runners’ heads. Freddy zoomed in. And just when the thought crept in – Did we miss him? – there was Rick, giving Freddy a five without breaking stride. On the way to the Metro, Kimberly – holding Freddy’s hand and carrying a not-light backpack full of dry clothes for Rick, extra warm clothes for them, snacks, water, and a sign she never used – talked about the change in lifestyle that had led to the marathon. Rick is a personal trainer. They have long been active people. But after Freddy was born, and after many years of on-again-off-again running, they re-committed to running road races, thinking it would set a good example. Kimberly has run a 10K and is working up to a half marathon. “I just so feel proud of my husband, because he worked so hard,” she said. 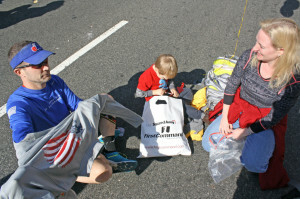 In the link up area, Freddy took a seat on the backpack, downed some juice, and settled in, while Rick pushed through the last couple miles to finish in 4:36. Kimberly smiled as Rick put on dry socks and a fresh shirt. Freddy honed in on a video game on Kimberly’s cell phone. The day had gone according to the timeline.